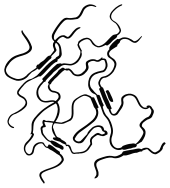 Thermoplastic elastomer: Elastomer comprising a thermoreversible network. Examples of TPE materials that come from block copolymers group are amongst others CAWITON® , THERMOLAST® K, THERMOLAST® M, Arnitel, Hytrel, Dryflex, Mediprene, Kraton, Pibiflex, Sofprene, and Laprene. Out of these styrenic block copolymers (TPE-s) are CAWITON®, THERMOLAST® K, THERMOLAST® M, Sofprene, Dryflex and Laprene. Desmopan or Elastollan are examples of Thermoplastic polyurethanes (TPU). Santoprene, Termoton, Solprene, THERMOLAST® V, Vegaprene, or Forprene are examples of TPV materials. Examples of Thermoplastic olefin elastomers (TPO) compound are For-Tec E or Engage. Ninjaflex used for 3D printing. It was not until the 1950s, when thermoplastic polyurethane polymers became available, that TPE became a commercial reality. During the 1960s styrene block copolymer became available, and in the 1970s a wide range of TPEs came on the scene. The worldwide usage of TPEs (680,000 tons/year in 1990) is growing at about nine percent per year. The styrene-butadiene materials possess a two-phase microstructure due to incompatibility between the polystyrene and polybutadiene blocks, the former separating into spheres or rods depending on the exact composition. With low polystyrene content, the material is elastomeric with the properties of the polybutadiene predominating. Generally they offer a much wider range of properties than conventional cross-linked rubbers because the composition can vary to suit final construction goals. Block copolymers are interesting because they can "microphase separate" to form periodic nanostructures, as in the styrene-butadiene-styrene (SBS) block copolymer shown at right. The polymer is known as Kraton and is used for shoe soles and adhesives. Owing to the microfine structure, the transmission electron microscope or TEM was needed to examine the structure. The butadiene matrix was stained with osmium tetroxide to provide contrast in the image. The material was made by living polymerization so that the blocks are almost monodisperse, so helping to create a very regular microstructure. The molecular weight of the polystyrene blocks in the main picture is 102,000; the inset picture has a molecular weight of 91,000, producing slightly smaller domains. The spacing between domains has been confirmed by small-angle X-ray scattering, a technique which gives information about microstructure. Since most polymers are incompatible with one another, forming a block polymer will usually result in phase separation, and the principle has been widely exploited since the introduction of the SBS block polymers, especially where one of the block is highly crystalline. One exception to the rule of incompatibility is the material Noryl, where polystyrene and polyphenylene oxide or PPO form a continuous blend with one another. Other TPEs have crystalline domains where one kind of block co-crystallizes with other block in adjacent chains, such as in copolyester rubbers, achieving the same effect as in the SBS block polymers. Depending on the block length, the domains are generally more stable than the latter owing to the higher crystal melting point. That point determines the processing temperatures needed to shape the material, as well as the ultimate service use temperatures of the product. Such materials include Hytrel, a polyester-polyether copolymer and Pebax, a nylon or polyamide-polyether copolymer. TPE materials have the potential to be recyclable since they can be molded, extruded and reused like plastics, but they have typical elastic properties of rubbers which are not recyclable owing to their thermosetting characteristics. They can also be ground up and turned into 3D printing filament with a recyclebot. TPE also require little or no compounding, with no need to add reinforcing agents, stabilizers or cure systems. Hence, batch-to-batch variations in weighting and metering components are absent, leading to improved consistency in both raw materials and fabricated articles. Depending on the environment, TPEs have outstanding thermal properties and material stability when exposed to a broad range of temperatures and non-polar materials. TPEs consume less energy to produce, can be colored easily by most dyes, and allow economical quality control. The two most important manufacturing methods with TPEs are extrusion and injection molding. TPEs can now be 3D printed and have been shown to be economically advantageous to make products using distributed manufacturing. Compression molding is seldom, if ever, used. Fabrication via injection molding is extremely rapid and highly economical. Both the equipment and methods normally used for the extrusion or injection molding of a conventional thermoplastic are generally suitable for TPEs. TPEs can also be processed by blow molding, melt calendaring, thermoforming, and heat welding. TPEs are used where conventional elastomers cannot provide the range of physical properties needed in the product. These materials find large application in the automotive sector and in household appliances sector. In 2014 the world market for TPEs reached a volume of ca. 16.7 billion US dollars. About 40% of all TPE products are used in the manufacturing of vehicles. For instance copolyester TPEs are used in snowmobile tracks where stiffness and abrasion resistance are at a premium. Thermoplastic olefins (TPO) are increasingly used as a roofing material. TPEs are also widely used for catheters where nylon block copolymers offer a range of softness ideal for patients. Thermoplastic silicone and olefin blends are used for extrusion of glass run and dynamic weatherstripping car profiles. Styrene block copolymers are used in shoe soles for their ease of processing, and widely as adhesives. Owing to their unrivaled abilities in two-component injection molding to various thermoplastic substrates, engineered TPS materials also cover a broad range of technical applications ranging from automotive market to consumer and medical products. Examples of those are soft grip surfaces, design elements, back-lit switches and surfaces, as well as sealings, gaskets, or damping elements. TPE is commonly used to make suspension bushings for automotive performance applications because of its greater resistance to deformation when compared to regular rubber bushings. Thermoplastics have experienced growth in the heating, ventilation, and air conditioning (HVAC) industry due to the function, cost effectiveness and adaptability to modify plastic resins into a variety of covers, fans and housings. TPE may also be used in medical devices and is also finding more and more uses as an electrical cable jacket and inner insulation. You'll also be able to find TPE used in some headphone cables. ^ a b Levensalor, Alex. "The Benefits of Hytrel in Modern Belting". Retrieved 2016-10-27. ^ Alemán, J. V.; Chadwick, A. V.; He, J.; Hess, M.; Horie, K.; Jones, R. G.; Kratochvíl, P.; Meisel, I.; Mita, I.; Moad, G.; Penczek, S.; Stepto, R. F. T. (1 January 2007). "Definitions of terms relating to the structure and processing of sols, gels, networks, and inorganic-organic hybrid materials (IUPAC Recommendations 2007)". Pure and Applied Chemistry. 79 (10): 1801–1829. doi:10.1351/pac200779101801. ^ "Innovation in materials". www.hutchinson.com. Retrieved 2017-02-27. ^ Woern, Aubrey L.; Pearce, Joshua M. (2017-10-30). "Distributed Manufacturing of Flexible Products: Technical Feasibility and Economic Viability". Technologies. 5 (4): 71. doi:10.3390/technologies5040071. ^ "Is Flexible 3D Printer Filament Worth the Investment? | 3DPrint.com | The Voice of 3D Printing / Additive Manufacturing". 3dprint.com. Retrieved 2018-03-10. ^ "Processing methods for thermoplastic elastomers-TPE - Introduction". www.tut.fi. Retrieved 2016-10-27. ^ Kuehner, Marcel. "Thermoplastic Elastomers (TPE) - Market Study - Ceresana". www.ceresana.com. ^ "ASTM D6878 / D6878M - 17 Standard Specification for Thermoplastic Polyolefin Based Sheet Roofing". www.astm.org. Retrieved 2018-03-18.